The bus ride from the Be’er Sheva University train station was unforgettable. We traveled two hours eastward through terrain unknown to me, and then the road descends, and continues to descend until we were at the Dead Sea. The bus follows the western shores of the Dead Sea, finally arriving at its last stop, the Ein Gedi oasis, our destination. 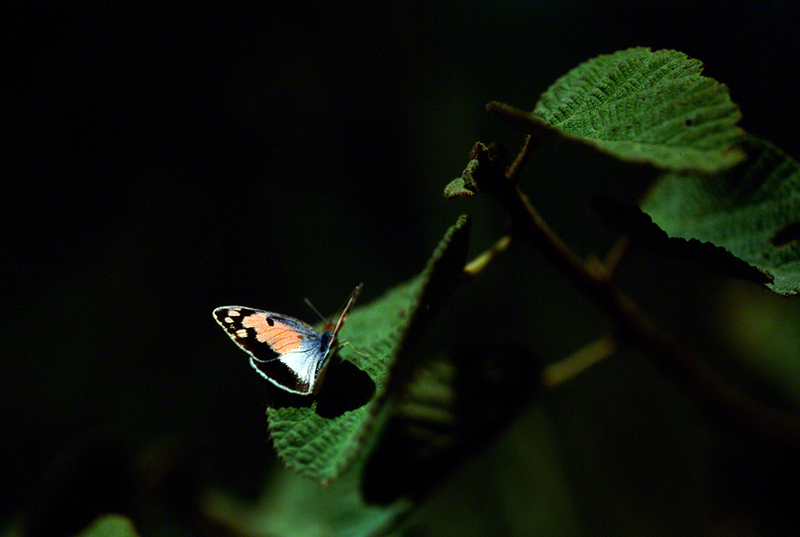 Colotis phisadia was the butterfly species that I was looking for. It was December in Israel, and the majority of Israeli butterflies were absent during Israel’s winter season. But this was a different place, Ein Gedi. It is the lowest place on earth, 400 meters below sea level. Though Tel Aviv‘s daytime temperatures were in the low 60’s Farenheit, Ein Gedi’s December days were a Middle Eastern 80 Farenheit. So it worked. I had traveled nearly 5 hours from my hosts in Binyamina, and the Blue-Spotted Arabs were flying. If southern Israel is desert, how can Ein Gedi be an oasis? When rain falls on the Judean mountains to the west of Ein Gedi it finds its way into underground water tables. That water works its way east until it reaches underground reserves at Ein Gedi. This system has sustained this oasis since well before David sought refuge there. Blue-spotted arabs are very wary, and most of my approaches are not rewarded. Almost every attempt I made ended with the butterfly fleeing. This female was kinder than most, and here she is for you to examine. Their habitat is limited in southeastern Israel and the southeastern coast of the Sinai Peninsula. All areas have a limited human population. To see them, you have to travel. Photographing Blue-Spotted Arab butterflies is unique in another way. Their home territory is so striking, so unique, so breath-taking that you long remember your experience of going to Ein Gedi to photograph them in the Wadi. Another beauty. The colors are vivid. Thanks Jim. They were just these gorgeous little butterflies, flying around in a rather spartan habitat. Apparently no one told them that they should be a little bit more reticent to stand out. Stand out they do, broadcasting their colors (limited as they may be) to their fullest. And it was just the kind of place that you just can’t go back to next week or next month or …. Wow, the colors are amazing! I love this photo! Thanks Rachel. I sought an image of this winged beauty. This is exactly how it looks at Ein Gedi. I’m pleased with it. Thanks for helping me achieve it. Very nice find. Love the colors.